Welcome to Week 51 of Year 5 here at PPF! Another year soon to be completed! Where do the weeks go?? This week random.org chose #70 - Maggie. Choosing which image to show from Maggie's post was a challenge. She (like Ileana last week) has been working on the 29 Faces in February challenge and showed 7 wonderful faces. It was a very hard choice to pick one so we just went with the first. Please drop by her site to see more! Welcome to Week 50 of Year 5 at Paint Party Friday! This week Random.org chose #39 - Ileana. Ileana has been participating in the 29 Faces in February challenge and has been creating a daily series of lovely, colourful and spirited ladies, each with her own unique story. Please drop by and check out all of her lovely ladies! Welcome to Week 49, Year 5 of Paint Party Friday! This week the random.org number generator chose #47: Saskia. Last week, Saskia shared her beautiful blue period re-creation inspired by Carla Sonheim's "Y is For Yellow Class". 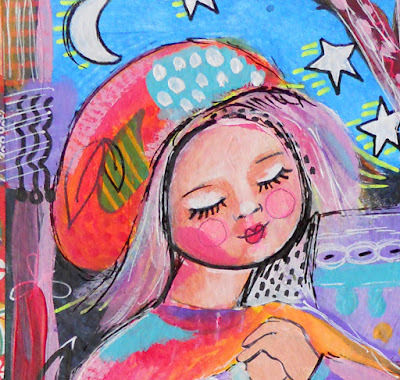 Please stop by her blog to see the other brilliant blue paintings she shared! Welcome to Week 48, Year 5 of Paint Party Friday! 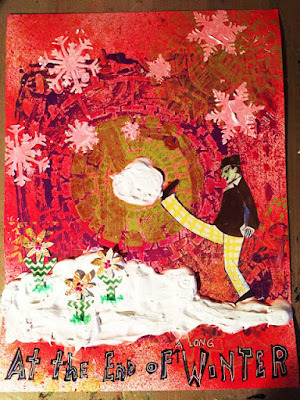 This week, the random.org number generator chose #40: Erika N. Last week Erika shared a wonderfully energetic and uniquely textured mixed media painting that I'm sure many of us can relate to this time of year! 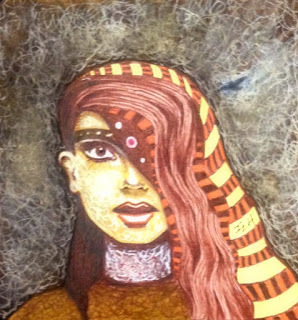 Please stop by her blog to read about the inspiration behind this piece. image courtesy of Erika N.
Wishing you an inspired week full of energetic painting!